51CRV Spring Steel Treated with "Delta-Tone" Corosive Resistant Coating. 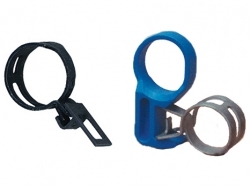 With pre-opened handi-clips, available in 2 sizes. 51CRV Spring Steel Treated with "Delta-Tone" Corosive Resistant Coating. With pre-opened handi-clips, Available in 12 sizes. Constant torque, spring steel fuel line and hose clamps from Northland Sales. Distributed in Canada by NLS Products.